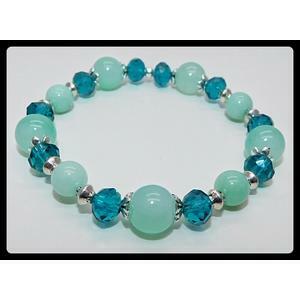 This elasticated bracelet is made from amazonite, tibetan silver and high quality glass beads. Your bracelet will come to you in a protective pouch with a small crystal tumble stone which is VERY IMPORTANT! This piece was was infused by our coven during our last Goddess Arianrhod ritual. The energies within it are very intense, so there are a few rules to follow! 1. This piece shouldn't be worn for longer than 12 hours at a time, and you should have a couple of days break before wearing it again. 2. You should not let anyone else wear this piece or handle it for more than a few moments under any circumstances. Now that all sounds rather strange doesn't it! As with all powerful magick, there are certain guidelines that need to be followed. This doesn't mean that this set is dangerous, far from it! It simply means that the energies within this piece can be very intense, and prolonged close contact with these energies can result in an overload of the senses which isn't suitable for someone without experience in dealing with this level of magick. As Welsh Wiccans we have a very rich history within ancient Welsh magick! We are very proud of the magickal methods and traditions that have passed down to us through the Welsh elders of our coven. A very important part of our Welsh magick involves working with the energies of the Welsh Goddess ARIANRHOD. Her name translated from Welsh into English means 'silver wheel' which represents the moon, and she is one of the 3 elements of our Welsh Moon Goddess, the other two elements being Cerridwen and Blodeuwedd. ARIANRHOD is associated with birth and rebirth, She is the deity of karma and reincarnation. She is the powerful Goddess of the lunar realm and her energies have been infused into this vessel by my coven. We have named this piece the 'RESCUE BRACELET' because we have asked Arianrhod to bless the wearer of the piece with the power to gradually turn their life around and make the changes that need to be made in order to be rescued from their current state of existence. This kind of magick is intended for someone that is serious about dramatically changing their life for the better. Are you trapped in a situation that is unbearable? Do you feel powerless to move on after a huge trauma? Do you feel that you are suffering in silence? 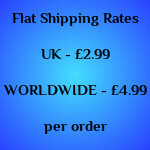 Arianrhod can help you to gradually turn things around bit by bit without harming anyone else. We only take part in these rituals once every so often because they are extremely draining both physically and emotionally. Arianrhod's energies are so intense that we have to 'split' the spell into two items. The major part of the spell is contained within the bracelet. The remaining part of the spell resides within the crystal. If the spell was cast into one single item, the item could not be worn by someone outside of the craft. When you are not wearing this piece, it should be kept in its pouch with the crystal, and when the bracelet sits with the crystal, the energies become transferred between the two pieces in perfect balance, making sure that neither the bracelet or the crystal becomes over loaded.